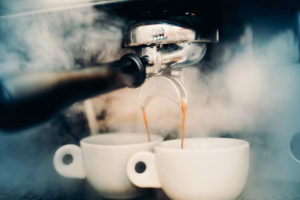 If you’re a coffee lover, you’ve probably ordered different types, such as the cappuccino, macchiato, latte, and ristretto, asides from your favorite cup of coffee. However, have you ever wondered why some of those types actually appear strikingly similar? For instance, at first glance, you might not be able to tell the difference between cappuccino and macchiato. To uncover the mystery behind the different names, different flavors, yet somewhat similar appearance, here’s a bit of not-so-common knowledge about the famous cappuccino and macchiato blends. Both cappuccino and macchiato originated from Italy, and both are espresso. Espresso, if you don’t already know, is perhaps the most popular coffee drink at any coffee shop. Brewed coffee is also popular, but more at restaurants, offices, and residences. For Café’s however, it’s the espresso. The cappuccino, named after the garment color of the Capuchin friars, was originally made of a double espresso with steamed milk. However, when the drink became popular outside of Italy during the 1930’s, several variations became popular. One of those variations is the cappuccino made with cream and a touch of cinnamon. Most, if not all, of the popular coffee drinks are a combination of espresso, milk, and foamed milk. The type of drink depends on the amount of espresso or milk. An espresso is made by forcing hot (close to boiling) water through ground coffee beans. The resulting coffee is highly concentrated, thus can be a bit bitter. Many people love a bitter espresso, but there are some who prefer to mask the bitterness a bit with milk, cream, and a bit of sugar. A cappuccino cup is an equal portion of double espresso, milk, and foamed milk on top. On the other hand, a macchiato demands a greater portion of espresso to milk. If a macchiato and cappuccino cup appears similar, it’s likely because the macchiato is actually a macchiato latte, which also has a layer of foamed milk on top but a greater portion of espresso as well. With so many different variations of both the cappuccino and macchiato, it’s almost impossible to get two cups that taste exactly the same; unless of course, you purchased the drinks one after the other. If you buy a cappuccino from one café and another from a café down the road, it’s likely that there will be differences in taste. Keep in mind that there are different types of coffee. Majority of the coffee in the market today is Arabica. Robusta may take a smaller share of the market, but there are coffee aficionados that prefer this type over the more popular Arabica. Asides from the different types of coffee, there are also different ways the beans are roasted. There is light, medium, and dark roast. As you might have assumed, each type of roast produces a different flavor. Lastly, when the coffee reaches your favorite café, the barista often mixes different coffee roasts or even types. There’s actually no steadfast rule in how to make an espresso. As long as a certain blend draws in followers, then the blend is acceptable. However, in terms of general taste, there is also a difference between cappuccino and macchiato. If you remember, a macchiato usually has a larger portion of espresso to milk. As such, the taste of the coffee is much more prominent than a cappuccino, which not only has milk but steamed milk on the top as well. If you love coffee then you’ll know that coffee is not just a drink, it’s a way of life. Therefore, just like life, you also need to follow certain rules when drinking a cappuccino or macchiato. It’s not imperative that you follow the rules, but if you want people to know that you’re a true aficionado, then you may want to give out not so subtle hints that you do in fact love coffee. Let’s begin with the Cappuccino. First, don’t be in too much of a hurry to sip on your cappuccino. Remember that the cup will usually have a layer of foamy milk on top. If you dip your lips at the moment it’s served, you might end up being a bit embarrassed with the foamy milk on your lips, or nose. Let the foamy milk settle before taking your first sip. Next, never order a cappuccino after noon. A cappuccino is a breakfast drink, at least that’s what it is for Italians. But don’t worry. If you’re not an Italian, people will understand if you order a cappuccino in the afternoon. When drinking a macchiato, you should never stir. If you can’t handle the bitter taste of the espresso, then order something easier, like a cappuccino or a latte. Keep in mind that a macchiato is for people who love the taste coffee, its bitterness and all. Cappuccino has become immensely popular that the drink even has a number of variations. Almost every country in the world has a unique variation of this popular drink. It’s actually a bit surprising because if you think of it, the basic foundation of the cappuccino should remain the same else it wouldn’t be one. The traditional recipe of the cappuccino is 1/3 espresso, 1/3 milk foam, and 1/3 steamed milk. However, the recipe doesn’t say what size of cup you can use, or if you can serve it with ice or not. As such, you can expect variations, like the cappuccino latte, iced cappuccino, and the cappuccino freddo. Unlike the cappuccino, the macchiato doesn’t have too many variations, although there are macchiato lattes and flavored macchiatos, such as vanilla or caramel. Now that you know the difference between cappuccino and macchiato, you should also be aware that both beverages have come a long way from their traditional recipes. Despite the many variations of these highly popular drinks, one thing will always remain the same. They will always be one the most popular coffee types in the entire world.